COME JOIN US! For this amazing event! Help Care-America.org! Children under 16 must wear a helmet and be accompanied by an adult aged 18 or older. While helmets are not required for adults, they are strongly recommended for safety and to set a good example for the children. 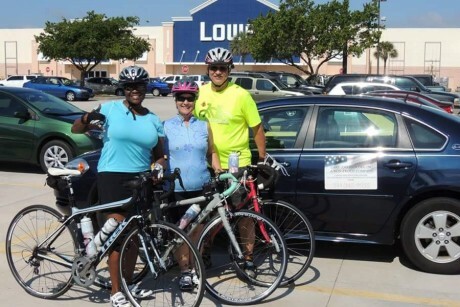 The ride will be starting from the Lowe’s parking lot located at 1934 South Hwy A1A. Sign in and late registration will be from 9:00 to 9:45 am. 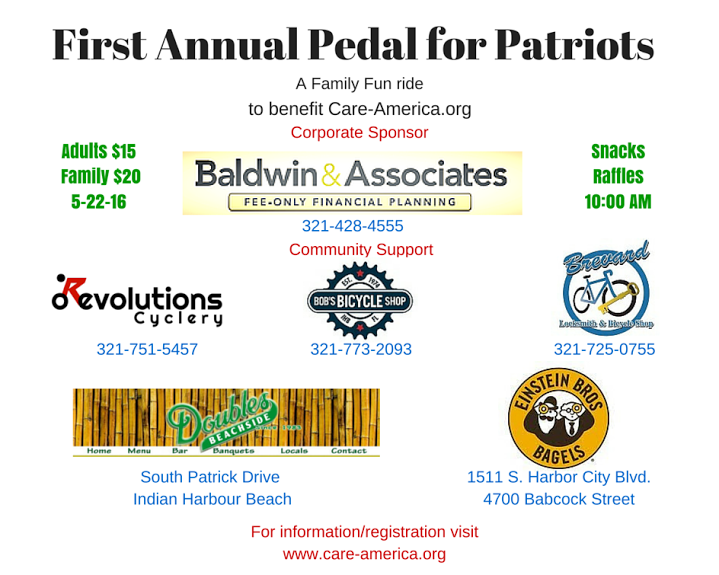 Everyone will be required to physically sign a waiver for ALL participants. At 9:45 the pledge and invocation will be given followed by rider briefing. Roll out will be at 10:00 am. 1) Riders will exit the north end of Lowe’s parking lot turning left onto Pinetree Drive to head west. 2) @ .8 miles on Pinetree Dr. riders will cross Osceola Dr. and bear right at the fork where the street changes names to Banana River Dr.
3) Riders will continue west and cross S. Patrick Dr. with caution. 4) Continue west past Oars and Paddles Park and over the Mather’s Bridge. 5) At @ 1.5 miles the road curves sharply to the right and becomes the South Tropical Trail. 6) Head north 4.5 miles to the Pineda Causeway interchange going under the bridge. This is the turnaround point. Ride back to the start following the same route. Be careful and have fun!